1. 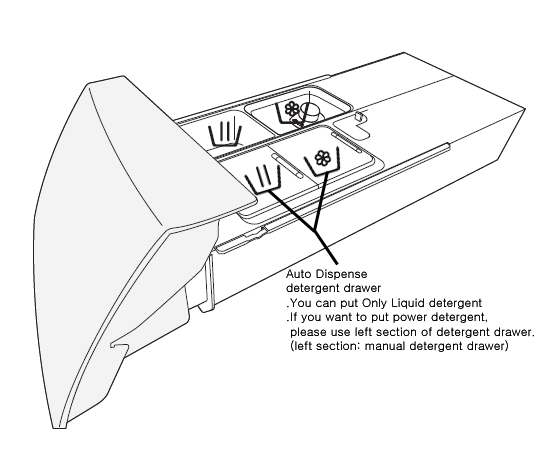 When using the auto dispense function, put liquid detergent and softner in the right side of the detergent drawer. Make sure to pour the detergent and softner only up to the MAX line. Otherwise, they might overflow and br mixed with one another. for one load of wash into the left detergent drawer. 3. After pouring the detergent in, close the drawer tightly so that there is no gap or opening. because water might splash into the detergent drawer. 5. After pushing the [Start/Pause] button, check that the light of the Auto dispense button is on. How do I use the detergent drawer compartments in my washing machine?